View of Alnmouth village from Church Hill. Photo Northumberland County Council, 1991. 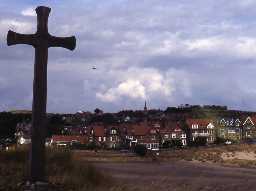 The village of Alnmouth sits amid sand dunes on the edge of the North Sea. As its name suggests, it is at the mouth of the River Aln. Although now a quiet coastal village, in the 18th century it was a busy port, exporting the agricultural wealth of the surrounding countryside. At Christmas 1806 a huge storm changed the course of the river and spelt the end for the busy harbour. From this time Alnmouth declined in importance, and became the quiet village it is today, though many traces of its former success remain. The earliest evidence for human activity in the area is a number of worked flint tools of the Mesolithic period. Traces of activity from this period are rare. Mesolithic people often settled near the coast. At Alnmouth they probably used the river and sea around the sheltered estuary as sources of food. The flint tools were found on a raised beach. The sea level has lowered since the Mesolithic period, leaving what used to be the coast, inland. This is just one example of how the changing nature of the coastline affects the archaeology of this area. The only traces of Bronze Age people comes from remains of some their graves in the area of Buston, where stone lined coffins have been found. Some of these burials were accompanied by well-preserved pottery vessels. There is very little evidence from the Iron Age and Roman periods. The only certain evidence is found to the north of Alnmouth, where prehistoric hut circles have been found in the area of the Common known as Beacon Hill. Despite the lack of evidence from the Roman period the River Aln is marked on a map by the geographer Ptolemy, which dates to about AD150, so they must have known of the area. In the early medieval period there may well have been an Anglo-Saxon settlement at Alnmouth. It may have been known by the name of Twyford. The Northumbrian monk, Bede, records that in AD 684, a church meeting was held at the place with two fords at the mouth of the river Aln. This is almost certainly Alnmouth. The meeting may have occurred close to Church Hill, where the remains of a carved stone cross show the likely location of an Anglo-Saxon church. Despite these earlier settlements Alnmouth only really became an important place in the medieval period. A borough was created by Eustace de Vesci in about 1147. Later, his son, a Norman knight called William de Vesci, was given permission to hold a court at Alnmouth in about 1152 so increasing its importance. It was a good place to build a town, as there was a safe natural harbour. The new town was made up of plots of land for buildings laid out along a main road, now called Northumberland Street. There was no need to build a new church, as a church still stood on Church Hill. However, this building was altered to make it grand enough for the new town. Unfortunately, the hill soon began to be eroded by the course of the river that ran around it. The hill began to be eaten away, and the church started to collapse. In the medieval period the town was a thriving port. Stone and grain were exported as well as wool, sheepskins and leather; fishing was also an important industry. Trade was particularly helped, when the Earls of Northumberland made Alnwick, just up-river from Alnmouth, their main centre. However, a raid by the Scots in 1336 and the generally poor economic conditions over the whole country at this time, sent Alnmouth into a long period of depression. Trade did die down in the later 16th and 17th centuries, but revived again in the 18th century, when Alnmouth exported grain and imported goods from London and Holland, and wood from Norway. Many new buildings were built at this time, including several large stone granaries. Despite the success of its trading links the town was increasingly troubled by the river and harbour silting up, making it difficult for ships to dock. Finally, on Christmas day 1806, there was a great storm. It changed the entire course of the river, which began to flow between Church Hill and the main town. The storm also finally destroyed the surviving remains of the church. After this, trade began to decline, though goods did not stop being imported until 1896. This led to changes in the town. Most of the old granaries were converted into houses and Alnmouth started to become a tourist resort. A holiday camp was built and beach huts placed on the sand dunes. Alnmouth even boasts the second oldest golf course in the country. Tourism remains the main industry today, and many visitors still come to enjoy its historic and natural sites.